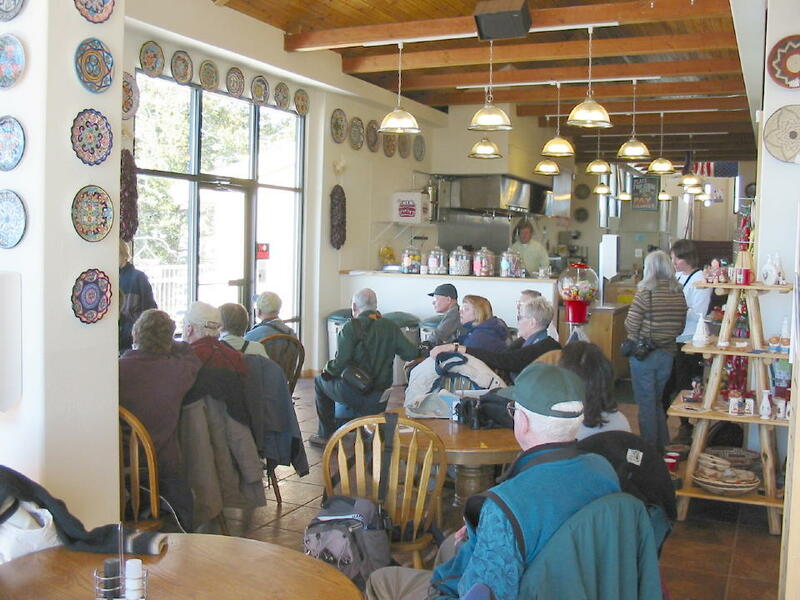 On this beautiful Saturday morning, over 30 members of the Central New Mexico Audubon Society (CNMAS) assembled at the Crest House to await the arrival of the rosy finches. Ken took the above panoramic photo before opening time. The group waited until about 10 AM before the first finches appeared. 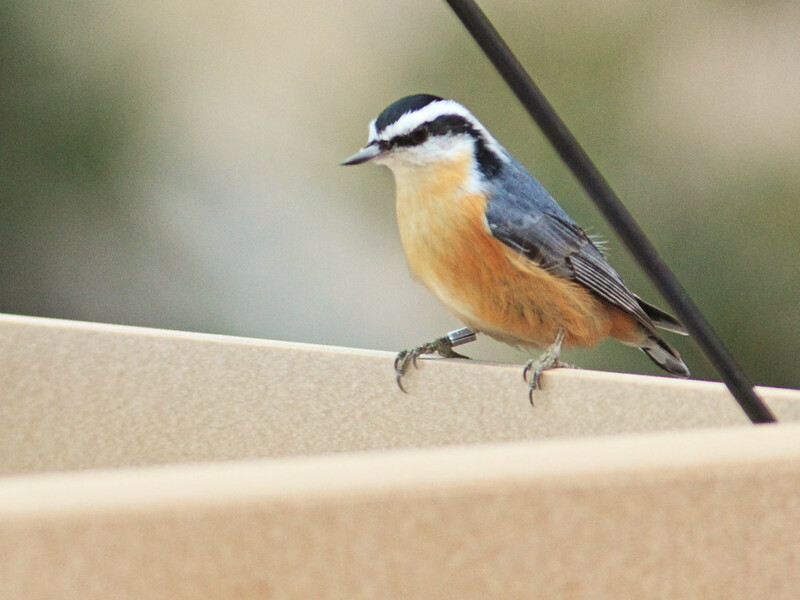 They wheeled about in a flock of 30 to 40 birds, then visited the hanging feeder on the deck briefly several times. All those that could be identified were Black Rosy-finches with the exception of a single Gray-crowned of the coastal (Hepburn's) subspecies. Repeatedly, the finches dive-bombed the deck area, some resting briefly on the Douglas-firs, only to re-join the flock and disappear downslope. Ryan Beaulieu and Raymond VanBuskirk (R&R) gave a presentation on their banding project, which included a demonstration of their home-made wire bird trap. R&R discussed finch behavior (little is known about winter site fidelity), taxonomy and anatomy (the wings of rosy-finches are remarkably long) and Ryan provided humanoid imitations of rosy-finch calls. (Click on images for full screen views). 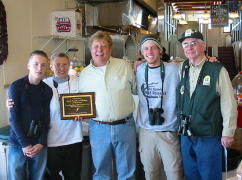 Once there was a lull in the finch activity, Elizabeth Hurts-Waitz, President of CNMAS, summoned Gene Romero, General Manager of Sandia Crest House and Restaurant, and presented him with a plaque (text below) that expressed the appreciation of birders from all over the world for the marvelous hospitality that he and his staff have extended to them. 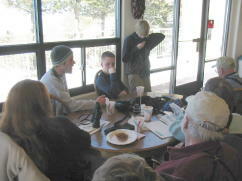 Attendees, who included visiting birders from Texas and Arizona, applauded enthusiastically. 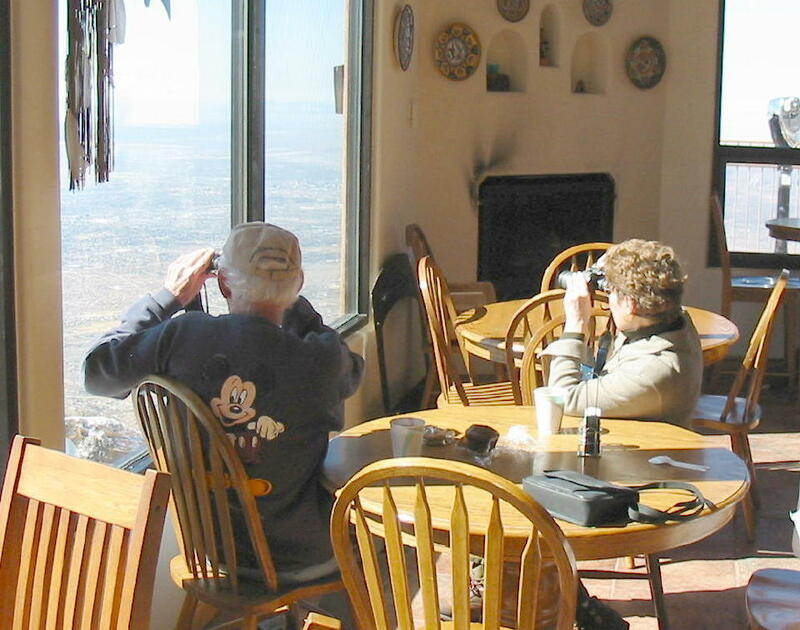 The honor recognizes the growing reputation of Sandia Crest as the most accessible location in the world for birding enthusiasts to simultaneously see all three North American species of rosy-finch . SNOW SCENES-- On the way up the Crest Road, Ken captured this view of the 10K Trail Head, a favored location for Pine Grosbeaks. None were there this morning, but Red Crossbills and Red-breasted Nuthatches were active in the trees. In the distance is a controlled burn and clear cut that is designed to encourage the growth of aspens. The young aspens provide a favorable habitat for the Dusky Flycatcher, which approaches the southern limit of its breeding range in this very area. Plan to visit in mid-May to see them! Click on this picture for a panorama that will scroll in your browser. More Views in and around the Crest House on March 7, 2004. Three feet of snow had fallen during the previous 9 days. 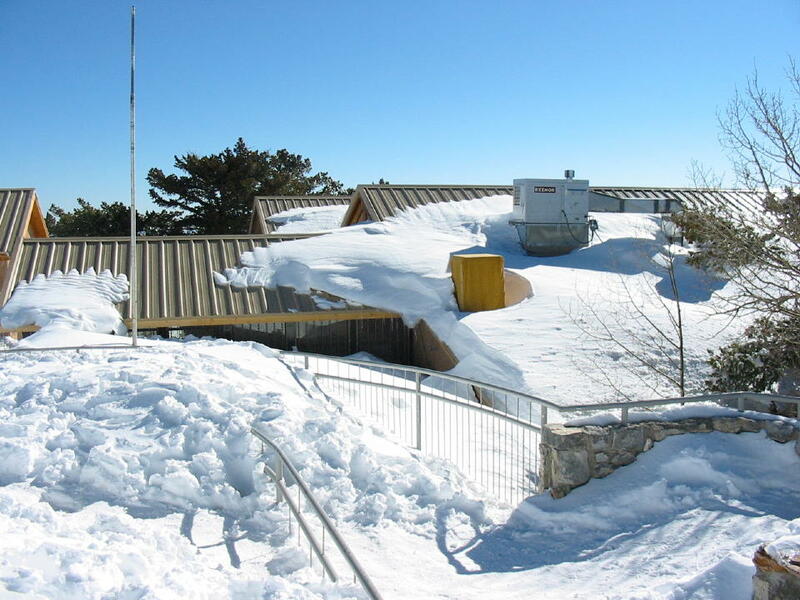 The west side of the Crest House had drifts up to the eaves. While taking the shot from the rear (south), Ken plunged into a waist-high drift and had to struggle to get out! Click on Thumbnails for full-screen views. We waited until 11:15 AM for the rosy-finches to appear. 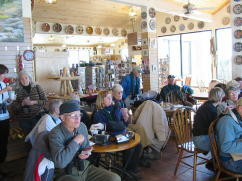 In early November, 2012 the Crest House suddenly announced that the business would be closed for the winter as of December 1st. 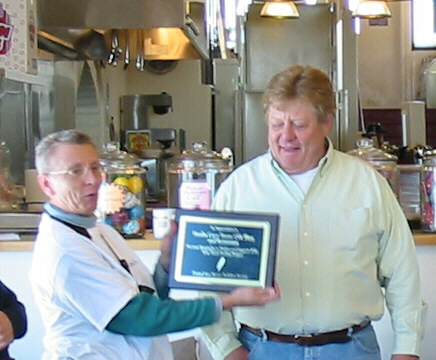 At the time, Gene Romero, Resident Manager, was ill and hospitalized. 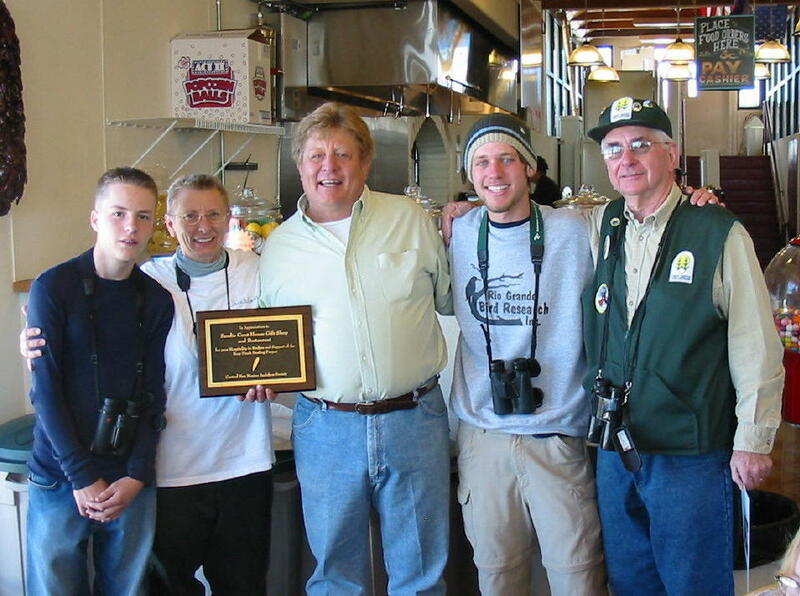 The American Birding Association had already scheduled its national Birding Rally for early February in Albuquerque. Banding for that winter was conducted at the feeder in the lower parking lot. 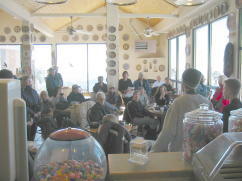 Since the rosy-finches were the centerpiece of the ABA meeting, the banding team had to scramble in order to accomodate several groups of attendees who had expected to view their operation in the warm comfort of the Crest House. 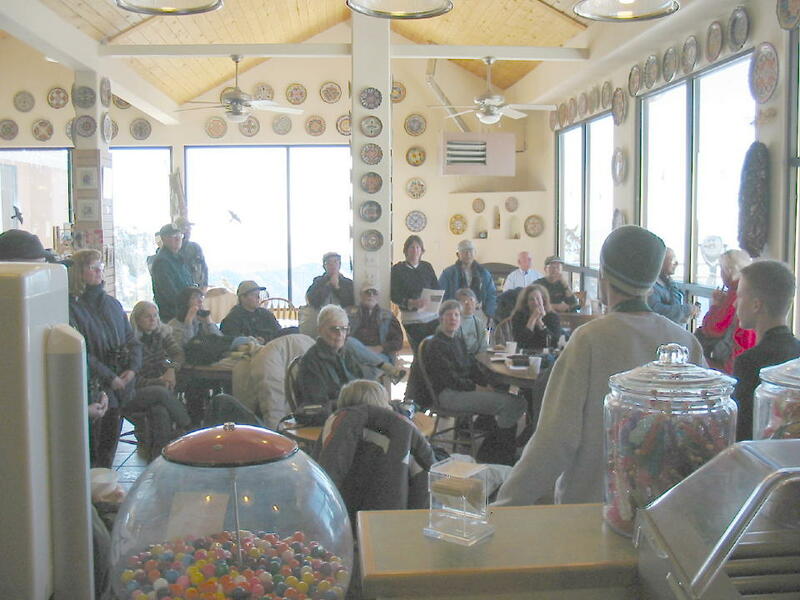 Despite the change in venue, the meeting was a great success. See this account on the ABA Blog. 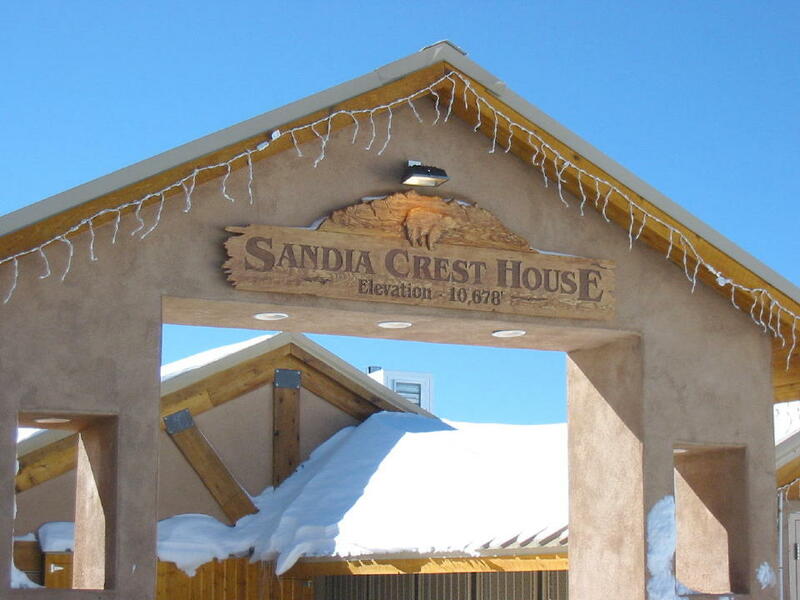 Andy Mayer of Two Mile High LLC announced that they purchased the Sandia Crest House about a month ago! 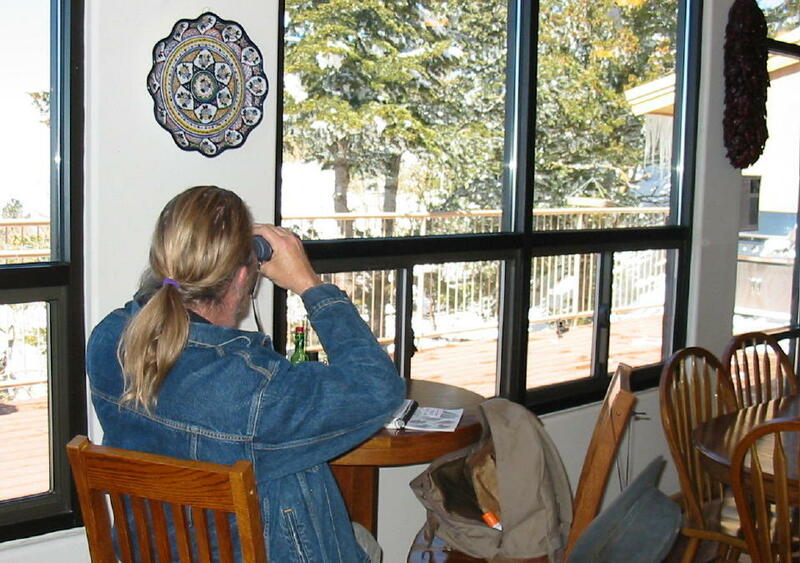 Andy is a native to Albuquerque and outdoor enthusiast, and is learning about all the aspects of life on the mountain and would like to better understand the birding opportunities and the needs of those coming to enjoy this unique location. Following the purchase, Andy stated: "Our first objective was to break the 6-month closure and simply get back to business. We have been open 2 weeks. From there, we are re-evaluating every aspect of what goes on at the property with fresh eyes and no assumptions. In time there are some exciting things we would like to start rolling out. We kept on several of the previous employees and have gotten a glimpse into life at 11,000 feet from their perspective." 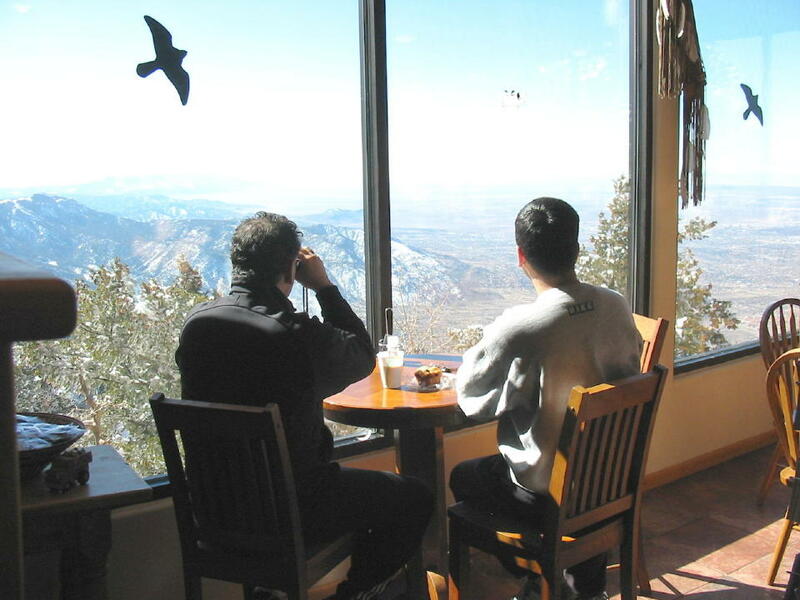 The new Sandia Crest House Web page has more information, including a menu for the restaurant. 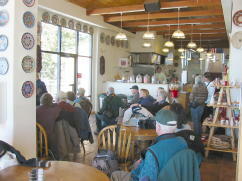 The regular visitors will be pleased to see that Green Chile Cheeseburgers and the famous Chile Stew are still being served. In early November, 2013, Mary Lou and I visited with Andy Mayer and Nick Harada, the new Crest House Manager. We are certain that Crest House Restaurant and Gift Store will continue to be birder-friendly, and know that visitors will appreciate their hospitality. I took this panoramic photo of the inside of the Crest House. It shows the kitchen area to the left and the dining tables and deck to the right. Windows that offer good views of the lower feeder are visible in the center background. This is another 180 degree panoramic view of the deck feeder overlooking the city of Albuquerque. This is a view of the lower feeder which I took from the SE picture window. 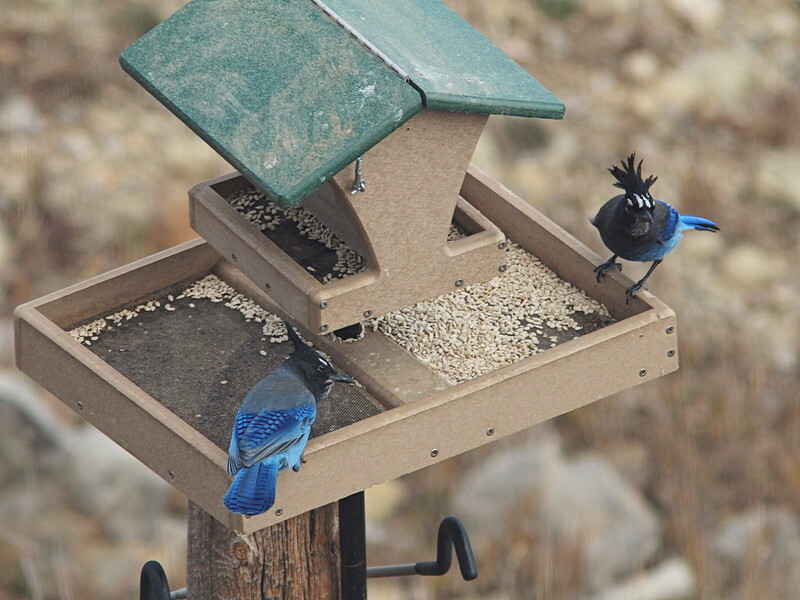 Rosy-finches had not yet arrived, but the Steller's Jays were enjoying the hull-less seed. Sad to say, but the first rosy-finches appeared just as we were departing on our plane! 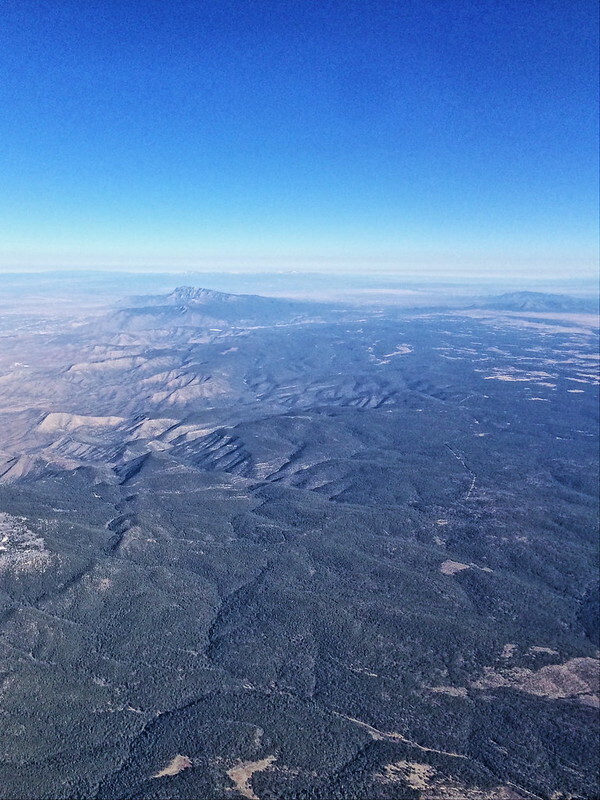 As we ascended over the Manzano Mountains, I looked to the north and could see Sandia Crest in the distance.